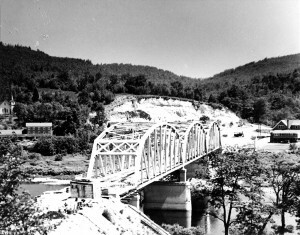 Barryville-Shohola Bridge was under construction until October 1941. Photo courtesy of Ed W.
January of 1941 was almost two degrees colder than normal in New York. But the month started off on a “lovely, clear and warm Wednesday,” according to Ella Leavenworth. Her son Jim bought his first car for $25. Thursday was pleasant, but quite cold. Aida walked the 1-1/2 mile round trip to the A&P, Harold’s, and the Post Office and back. Mary Wormuth stopped in for a few minutes after paying Lon for the hay. It snowed about two inches before dark. It got so cold that Aida slept out in the sitting room near the wood stove. There was no snow on Friday which was cloudy and cold. But at least the temperature was warmer than Thursday. Warm enough that Aida could sleep in her own bed, though she still checked the fire several times in the night. Friday Anna Meyers helped her sister Clara get set up in her new home. Garfield worked up there also. Lon Austin went for bread and milk Friday and Saturday. It was so warm, Aida let the fire go out. She built a new fire Sunday morning, January 5, when the weather turned cold and it was windy all day. Sunday was an exciting day for Clara Hansen and her family. They were able to completely move into their new home. Garfield and Ella took care of the three grandsons so Anna could help. Monday it snowed. Garfield and Ella moved Jim’s bed back upstairs. Tuesday it snowed, but that didn’t stop Lon Austin from going to the Village to get the Daily News. In the afternoon Teenie Stevens took some papers to Aida. Monday and Tuesday Aida slept in her front room because it was so cold and windy. Wednesday was warmer and she was able to sleep in her own bed. Thursday the weather was quite a little warmer. Ella went to Goldie and Stella’s. Friday was quite cold, but pleasant. Lon walked to the Village in the morning and Aida at noon. Garfield worked on Lee’s porch. Lee moved his hens to his new place. Clara and Anna and their families spent the evening at Garfield and Ella’s. Stella and Goldie were in for a few minutes. Saturday was colder, but sunny. Lee Hansen took his pigs up to their new home. Saturday Lon was down to the Village. Sunday, January 12, it was quite cold but pleasant. Sunday Garfield and Ella went to Goldie’s. They stopped to see Clara in her new house. The sun peeked through the clouds on a cold, windy Monday. Eldred was very cold with sunshine on Tuesday. Clara and her sons spent the warmer, but cloudy Wednesday at Ella’s. Garfield and Jim drew six loads of oak slab wood from Steiner’s. In Eldred on Monday, Anna’s nephew Jim Leavenworth worked for Mr. Steiner again. Tuesday Aida Austin rode up to the A&P with Floyd Boyd and Alex Wait. About one o’clock, Lon went to Port Jervis with their nephew Bill Austin. In Islip on Tuesday afternoon, Mrs. Lois Smith (a very pleasant lady who liked Jimmie B. the cat) came after two little rugs Anna had made. On Wednesday in Eldred, Clara and Anna and their sons visited with Ella. Clara hung out her wash. Bill, Goldie, and Lee, were in for a while. On the east side of Eldred, Aida wrote Emma Waidler and sent the letter in the afternoon mail. Thursday afternoon, even though the roads were icy, Aida went to Mae’s, but Mae had gone to Port Jervis. Mrs. Bye, who was also at Mae’s, accompanied Aida on the way to the Village. Friday Aida bought butter on her daily outing to the store. It “commenced snowing about one o’clock,” and continued to snow. The shovel plow went out about seven o’clock. Saturday Lon shoveled a path from his house to Aida’s kitchen door so she could get water; and a path from his porch to the road. On the west side of Eldred Goldie and Stella were at his folks’ house for dinner. Jim drove to Narrowsburg and visited the Clarks in the evening. Sunday morning, January 26, Lon went to a special Methodist Church meeting with Alfred Hill. Alfred drove a group of folks to Barryville in his school bus. Lon wasn’t feeling well on Monday when he went to the Village to get bread. He was sick all day Tuesday. Aida tried to see Lon a couple times, but his door was locked. “He seems pretty sick, but he wouldn’t let me send for the doctor,” Aida jotted in her diary. Fortunately Lon was able to unlock the door. When Aida returned after a short visit with Mary Bosch, Aida was able to see her brother and build up the fire in the stove. Aida was at Lon’s three times Tuesday night—9 p.m., midnight, and 3:30 a.m.—to fix the fire in Lon’s stove. Wednesday in west Eldred, Clara and her sons visited with Ella all day. Garfield and Ella so enjoyed their grandsons. Ella’s radio broke and Clara’s husband Lee loaned them his small radio. Goldie took the broken radio to Millard Hulse to be fixed. Wednesday in Islip, Anna worked on British Relief Blankets. She hoped to have six done for Thursday; and eventually 100. January ended on a very cold day. Aida went to the A&P, the Post Office, and also Harold’s. This entry was posted in Aida Austin Diary, Book excerpts, Farewell to Eldred. Bookmark the permalink.